Music is what you want, but what about the DJ's? Anyone can just push buttons, but not everyone can DJ! It takes expertise, experience and skill to put together all of the parts to compile a successful evening of music. A great DJ must know the music, they must be able to read the crowd, they must be able to work the room, work the microphone and above all -- Entertain! Even playing your favorite music videos on our large screen monitors! 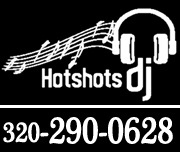 If music, dancing, and fun is what you're looking for, let HotShots DJ be the exciting entertainment for your special event. Continue to look around on our website for music, photos, agreements, and contact information. Let us do the rest! We look forward to being your entertainment. Every thing is included in the price Experienced dj - High quality sound and light - grand march intro -﻿﻿wireless mic and music videos playing troughtout the night!